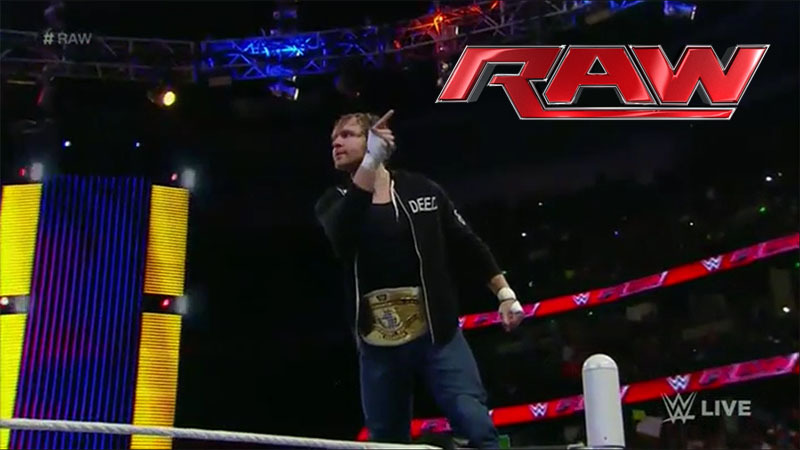 Recap of the contract signing and Ambrose going after Lesnar last week on RAW. Dean Ambrose’s music plays and he heads to the ring. Ambrose says he is in for the fight of his life on Sunday, but this is Monday. And it’s RAW. He talks about how Lesnar is probably looking for revenge from last week. He calls Lesnar a gorilla and tells him to come to the ring. Stephanie McMahon heads to the ring instead. Stephanie tells Ambrose he couldn’t get the job done last week and that Reigns had to come out to help. ** Which is true. ** She asks Dean if he wants an F5. He does. Stephanie says he’s going to get one, but “F5” stands for “Fatal Five Way.” He has to defend his IC title in a Fatal Five Way match tonight. Also, if Reigns interferes then Ambrose is out of the triple threat at Fastlane. This was a really good match. With so many guys you would expect the action to be frenetic, and it was. There was always something happening. From the outset, it would seem like Breeze and Stardust were just in there as filler and fodder, but they both had very good showings and felt like they belonged in the match (of course they are both good enough, but story-wise they haven’t been in the IC hunt until this match). There were some really great moments, moves, and sequences. Dolph Ziggler probably had the best moves of the match, but Tyler Breeze probably came the closest to winning before the actual finish happened. Very good match, and a nicely interesting development for the triple threat and for the Owens/Ziggler feud. I like it when they can further multiple stories with one segment. Renee Young asks Ambrose if he’s in shock. He’s not shocked, but he is angry. The Authority hasn’t taken from him, they’ve just given him more motivation to win at Fastlane and to go on to beat Triple H.
Kevin Owens tells Renee that he told everyone that the IC title is his. He tells her to tell everyone that he was right. Ziggler gives Owens a slow clap and congratulates him. He points out that he’s beaten Owens and that he deserves a title shot. Owens doesn’t care. New Day talks about how Edge & Christian brought a kazoo to a trombone fight. Big E also learns what a recorder is. New Day will be guests on the Cutting Edge Peep Show at Fastlane. They are also angry about Mark Henry walking out on them in their match last week. They call him the world’s largest booty hole. Quite a good match. It’s rare to see Mark Henry fight angry anymore, and it’s rare to see Big E manhandled ever. I really like this fight between two big men. Both of them looked good and both of them showed incredible strength. Unfortunately it looked like Mark Henry injured himself at the end of the match. He was set up for the Big Ending and pushed himself off of Big E’s shoulder. When he landed he just fell to the mat. I hope it’s not serious. Oh, and as an added bonus, Big E called himself the “New Sexual Chocolate” during the match. Love it. Byron Saxton welcomes Brie Bella to the ring. Brie starts by saying that Daniel Bryan is excited to start the next chapter in his life. As she’s talking Charlotte comes out and interrupts. Charlotte says Daniel Bryan was in a league of his own. Brie corrects her by saying he “is” in a league of his own. Charlotte says she understands if Brie needs to forfeit Fastlane to be at home with her husband. She says Brie is selfish. Brie tells her that Daniel Bryan supports her 100%. Charlotte rebuts by saying that Brie is now financially supporting Daniel Bryan. She tells Brie to go home and be a good sister and wife. Brie accuses Charlotte of trying to take cheap shots and mess with her head because she knows Brie can’t be easily beaten. Brie is disgusted by Charlotte. Charlotte insults Brie and Daniel’s eventual goat-faced vegan babies. Brie attacks. Charlotte backs off. ** I’m still more interested in the other women’s match at Fastlane, but this segment certainly helped this feud. I don’t really like Charlotte on the mic though. She sounds overly rehearsed or something. One thing that I find a little distressing about this feud is that both women are using men as conduits to reach the audience. Charlotte with her father and Brie with Daniel. Story-wise, it’s really Charlotte that’s making the men an issue whereas Brie is strong and independent. But from an overall story perspective, both sides are using men as drivers for their feud. Very good match. Being in the ring with Styles seemed to up The Miz’s game. He looked good in the match. AJ looked good too, and some of his moves, like the Pele Kick, looked as smooth as I’ve seen them so far in the WWE. It seems like he’s adjusting very quickly to the WWE style. I also like the little things in the match that the commentators failed to mention. Such as The Miz ducking the spinning backfist, the move that broke one of his teeth in their last match. Jericho starts to talk to AJ, but AJ cuts him off. AJ challenges Jericho to a tie-breaking match at Fastlane. Jericho says he’s not sure. He’ll think about it and let everyone know on Smackdown. The Dudley Boyz head to the ring. They go under the ring for a table, but they quickly put it back. In the ring, they call out The Usos. Oh, but they’re probably not in the arena because of last week. D-Von gives the WWE Universe a news flash. They are not on a farewell tour. They are the baddest tag team on the planet. Bubba reminds everyone that the tables are gone forever (though the tables are on the WWE network). An okay match. This was obviously supposed to be a new debut for Summer Rae as a serious wrestler, but it didn’t look like much has changed. The moves she did early were okay, but she was obviously relying on and waiting on Paige in order to accomplish them. Paige, on the other hand, never looked like she needed Summer’s help to pull off any moves. There’s a big difference there. I really think Summer should have gone back to NXT for a while if she wants to be taken seriously in the ring. This match didn’t do it for me. Also, I don’t think Paige should be relegated to a veteran-type role yet. Ever since her feud with Charlotte ended she has been floating with no real purpose and with no definite character. She seems to be there to put over other people. She’s not there yet. She needs to take a stand and reaffirm her place in the women’s division. Paul Heyman heads to the ring. He calls out Roman Reigns so he can say what he has to say to his face. Reigns heads to the ring. Heyman thanks Reigns for coming to the ring and reminds him that he has the utmost respect for Reigns. Heyman says that he thinks that Reigns and Ambrose combined will not beat Lesnar. He tells Reigns that he has a choice to make on Sunday: his brother or his daughter. He paints a picture of a man in divorce court or a man alone in the locker room. His argument makes the point that Ambrose is the bigger enemy since he is his friend. Reigns thanks Heyman for speaking his mind and making good points. He says he’s already made a choice and that he and Ambrose already know they will fight each other to win. He points out that he’s beaten Ambrose, but he has never beaten Lesnar. Reigns says he will win at Fastlane, and he will win at Wrestlemania. He says he knows that Heyman believes that. Heyman nods and leaves the ring. THE DUDLEY BOYZ attack Reigns from behind! Ambrose runs out to help Reigns. They clear the Dudleys from the ring. Afterwards, Ambrose sets up Dirty Deeds on Reigns but doesn’t follow through. They share a laugh. An okay match. It was good, but it was very short. Ryder and the Outcasts have had way better matches recently on the shows that no one watches, Main Event and Superstars. Earlier today, Goldust waits on R-Truth and his date at a restaurant. Goldust opens a bottle of champagne all over R-Truth’s date. This was a fun match. It broke down very, very quickly which led to a nice triple dive by the Lucha Dragons and Neville. After the break it became a normal match again, but it eventually had another breakdown for the finish. I’m not sure that it built up anything between Kalisto and Del Rio, but I suppose it gave a little momentum to Del Rio regardless. Since the US Title match has been demoted to the pre-show at Fastlane, I guess this match was good enough. It does build a case for my idea to have the US Title defended and featured on Main Event and Superstars though. They don’t really seem to care about it, so why not, right? WWE celebrates Black History Month with a look at Booker T. They got his WCW title record wrong though. He wasn’t a 5 time champ. He was a 5 time, 5 time, 5 time, 5 time, 5 time champ. From Facebook, Naomi and Tamina attack Becky Lynch in the parking lot before RAW. Renee Young asks Del Rio if his momentum will carry over to Fastlane. Del Rio again says that Kalisto’s wins were flukes. He says that their match at Fastlane must be 2-out-of-3 falls. A frantic but pretty good match. They didn’t have much time, but they managed to get done what needed to be done. Becky was angry and showed that she can beat Team BAD without help from Sasha. I think that was important because Becky seems to have been the weak link lately. This started to turn that around. After the match Tamina and Naomi attack Becky. Sasha Banks comes out, but she doesn’t seem to be in too much of a hurry to help Becky. Regardless, Becky and Sasha stand together in the ring. The Wyatt Family heads to the ring. Harper says everyone has a choice tonight: awaken from your slumber or beg for mercy. Rowan says that without the Wyatts, there is no hope. Bray says that his family speaks the truth. This world is a slave. A slave to social media. Bray’s followers would dismantle that machine and bring about paradise. All he asks is that everyone bow to him. Bow to him. We all have to make a choice, or Bray will make that choice for us. Strowman tells us to wake up or run. This was definitely not a great match and a strange choice as a main event considering that it currently has nothing to do with Fastlane. The Wyatts continue to attack Big Show. Ryback comes out and gets overwhelmed. Kane then comes out from under the ring and helps Big Show and Ryback clear the Wyatts from the ring. This was a pretty good show with some nice surprises, but the ending confuses me. Why make that the final segment of the last RAW before Fastlane? I mean, I guess it’s obvious they’re building towards a Fastlane match, but shouldn’t they focus on the main event in the main event segment? Easily the best match of the night. It was exciting, unexpected, and everyone looked good, even the people that don’t have a stake in Fastlane. It furthered multiple storylines and was an entertaining match to watch again even without the context of the current storylines.